Gummybear International releases new Gummibär St. Patrick's Day Stickers - Gummybear International Inc.
Gummybear International, the creators and owners of the Gummibär brand, is continuing its line of Gummibär stickers with its latest addition, the Gummibär St. Patrick’s Day stickers. These collectible sticker designs feature the famous Gummibär character in multiple St. Patrick’s Day poses with various St. Patrick’s Day symbols. 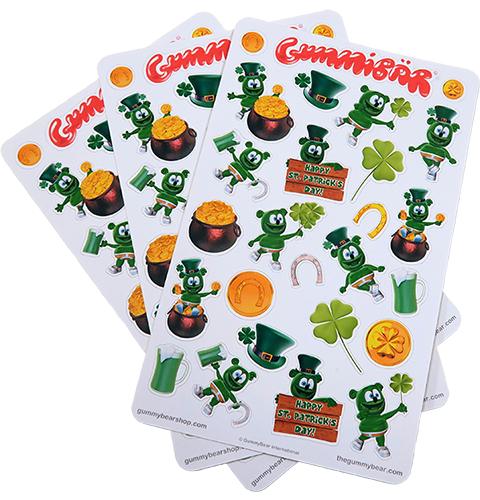 Gummibär St. Patrick’s Day stickers are now available in the Gummibär Shop at $5.00 per set of three sheets.